This was the final carol last night at the Service of Nine Lessons and Carols in Holy Trinity Church, Rathmines, organised by the staff and students of the Church of Ireland Theological Institute. Earlier in the evening, the choir sang the carol, Gaudete! gaudete! Christus est natus. It was an appropriate carol, as next Sunday [13 December 2015], the Third Sunday of Advent, is Gaudete Sunday. This year, as part of my spiritual reflections for Advent, I am thinking about Dietrich Bonhoeffer, and his thoughts about Advent and our preparations for Christmas. But last year, I reflected on an appropriate hymn for Advent each morning, and on Gaudete Sunday [14 December 2014], I chose this carol Gaudete!, which reached No 14 in the charts in England with Steeleye Span in the early 1970s. I wrote at that time last year of how this song was popular in the early 1970s, and how I first heard it around the same time as I was introduced to English folk rock while I was in the English Midlands and writing for the Lichfield Mercury. Perhaps the story of this carol is worth telling once more. The guitarist Bob Johnson had heard the song when he attended a folk-carol service with his father-in-law in Cambridge, and brought it to the attention of the rest of the band. Since the mid-1970s, despite the change in their line-up and the loss of names like Maddy Prior and Gay and Terry Woods at different times, Steeleye Span often include Gaudete as a concert encore, and it was published in 1992 in the New Oxford Book of Carols. 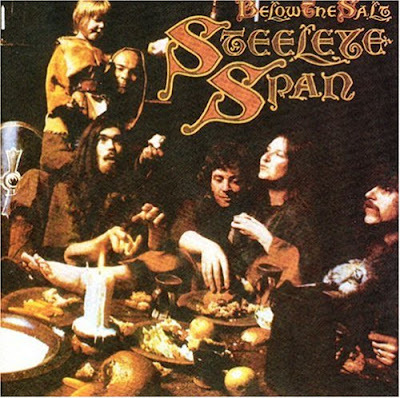 Their latest album, The Essential Steeleye Span – Catch Up, was released earlier this year. This double CD looks back at their recent history, including their collaboration with the late Sir Terry Pratchett, and features some of the most memorable moments in their long career, a number of new recordings of their most famous songs, rare and unreleased material, and, of course, Gaudete, from the album Present, which is Track 5 on the first CD. I missed Steeleye Span’s live concert in Vicar Street, Dublin, last year. They are currently touring Britain on a tour that began in Shrewsbury last month [17 November 2015] and that ends in Saisbury next Thursday [17 December 2015].